Most locations in Stoke on Trent carry a road sign telling you where you are, but Trent Vale doesn’t. And yet it ought to for, historically, it is probably the most important place in Stoke on Trent. From its boundary with the City General Hospital the geography of Trent Vale is shaped like a triangle with Springfields and Penkhull in the north falling to the Trent Valley through Boothen and Oakhill. It’s a mishmash of old hamlets with a lot of tree-lined streets, some edged with Sutton Trust Houses that improbably have seen three generations of families raised in their tiny rooms. Through his cynical trademark however I get the impression Mark really likes and respects his hometown. Black humour and comic poems – “‘If you don’t laugh you’ll cry’ type of stuff,” he says. Trent Vale is a place that was once very important in industrial terms. Brick and tiles that were central to Stoke-on-Trent’s building industry were made here for many years. 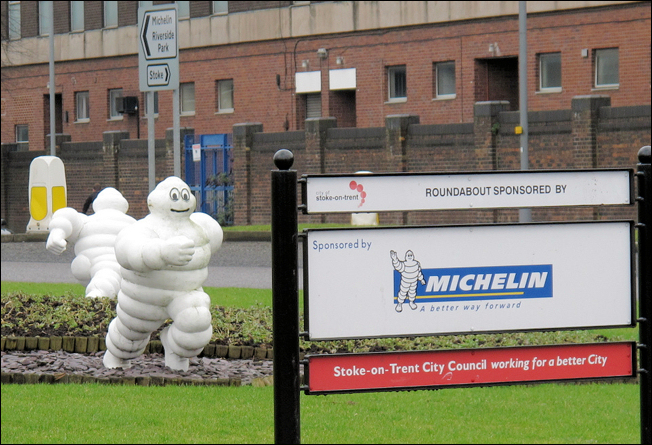 The Michelin Tyre Company arrived in 1927 and occupied 80 acres of land between London Road and Campbell Road. And millions of baker’s dozens are still cooked weekly at local bakeries, though not as many as fifty years ago. Overlooking the recently flattened Michelin factory Mark and I meet up with two of Stoke-on-Trent’s principal academic historians, Bill Klemperer, an inspector of ancient monuments for English Heritage, and Debbie Ford, Collections Officer for Local History at the Potteries Museum and Art Gallery. Why is Trent Vale so important I ask? Bill began a narrative. “In the late 1920s a local archaeologist and school teacher, Thomas Pape, was walking around Trent Vale and quite literally picked up a comprehensive load of Roman Samian pottery made from local clays. In the 1950s a Stoke-on-Trent museum curator, Arnold Mountford, decided that the evidence of Roman occupation was so overwhelming that he made some trial digs. The invasion of Britain under Claudius in AD43 is dated fairly accurately, but the interesting fact is the site at Trent Vale can be positively dated just two years later. Trent Vale must have been an important staging post where soldiers garrisoned. Is this proof that for a significant interlude Trent Vale was an important Roman settlement? “The kiln can be dated no later than AD60. Taken the other proof it possibly indicates that the settlement was here for at least 25 years. What is fascinating is that it is so early in the Roman occupation of Britain. Material was continental – Samian ware would have been made in Gaul then under Roman occupation,” explains Debbie. Unfortunately the 1950s digs were limited in their scope. Enhanced excavations were later undertaken at the fortress of Chesterton along the Roman road that passed alongside and across the Trent Valley. Chesterton was one of five known major Roman centres in Staffordshire. These centres represented military movement through the county on the route to the principal garrison at Chester. There is no evidence of any other Roman kilns in this area although there was a massive site at Mancetta outside the south east of Staffordshire where a huge pottery manufactory was established. It was kept going for years and obviously supplied traffic passing along Watling Street. And sadly, by comparison, we don’t know all that much about the Trent Vale site even from the excavation plans. The landscape has changed dramatically. The tile and brick works have gone. A huge marl pit was filled in long ago. The limitations of the 1950s excavations are inconclusive. Who knows what might have been found or missed had industry not forced the hand of heritage? Everything has been disturbed by the pillage of industry, much of it buried and reburied under the Michelin factory. Incalculable damage has been caused by modern occupation therefore we will never know just how important the settlement at Trent Vale really was. They shake their oatcakes at the sky daring God to try it. A few spits and spots and nothing more, the sun is always shining. It’s the Mediterranean of the north, washing lines and ironing. Children, lightly grilled, sip alcopops through straws. Across the Potteries it’s raining but today in Trent Vale the sun really is shining – honest. Wheatley's Brick & Tile Co., Trent Vale, Newcastle. Wheatly's was established before 1819 and was famous for its 'Triton' brand roofing tiles. 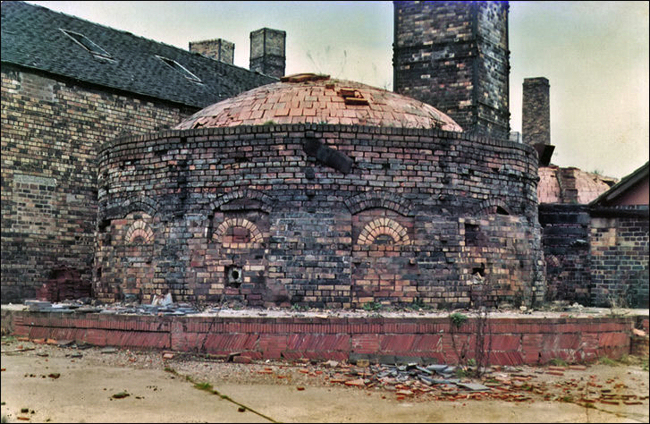 In 1978 the company was taken over by Daniel Platt Ltd of Brownhills Tileries in Stoke, then in 1982 works was closed and demolished soon afterwards.